I thought this book was really well written and researched. I was fascinated with the details and especially with the glimpses outside the family. They were so painfully unaware of all that went on in their country, it's hard to believe. It is amazing what lengths people will go to to retain power, even if they "don't want it," as Nicholas said several times. I remember going to an exhibit on Nicholas and Alexandra when I was a teen and being super fascinated by their story. It is just so horrifying and the history of the Russian people at this time (and during a number of other times) is so sad that I can't get it out of my head. I know I read a biography (or two) of the Romanovs, but I still felt like I knew almost nothing about the time period and the lower classes. Great book to introduce this period of time to young people! I loved this one. The Romanov's are one of my favorite historical families to read about because they are just so...something. over the top? I kind of wish Flemming had talked a little about the mystery regarding their bodies and their eventual discovery, but I suppose that wasn't really the purpose of this book. I also really loved how she mixed in so much information about lower class Russians and what they were experiencing at the same time the Romanov's were out cruising the baltics. Fascinating. I know what you mean - they are so intriguing! I'd have liked more of the mystery about their bodies too, though I liked the current info on finding the daughter's body rather recently. It sounds like this is a great introduction to a period of history that most adults still don't understand. Especially with today's constant access to news and the rest of the world thanks to social media, it is unfathomable that the family was so clueless. Oh, I guess with how easy it is for us to access news it's hard to imagine people in power not having that same kind of access. But it sure was a different time! It's almost like they purposely didn't want to know! This book sounds really interesting. Its actually one of the picks this month for a book club I'm in on Goodreads, but unfortunately I'm too swamped at the moment to read along. Hopefully I will get to it in time. Nice review, thanks for sharing. Hope you get a chance to pick it up when you're less busy! Thanks for the comment. 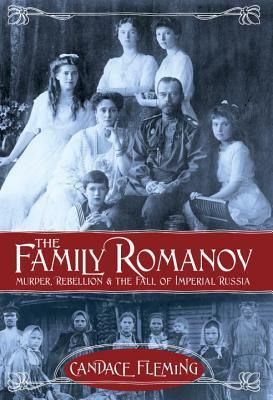 I find the Romanovs fascinating. I definitely need to read this one! It will feed your fascination for sure!